- Calcium chloride plant will have production capacity of 135000 TPA. - Project is part of existing chemical complex incorporating caustic soda, EDC, VCM, and PVC plants. - Sanmar Group plans to invest $ 1.5 billion in the chemical complex for future business growth. Noida, 27 September, 2016. 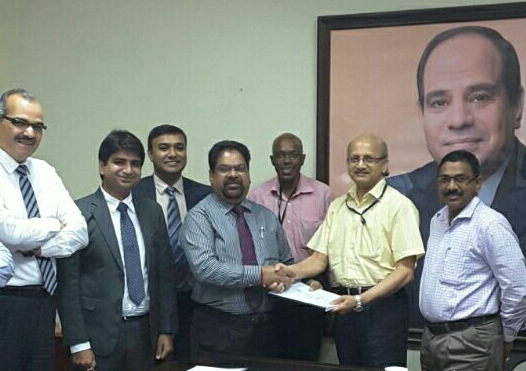 Nuberg, a leading global EPC & LSTK company for speciality chemicals has announced their win of a calcium chloride plant project on EPC & LSTK basis in Port Said, Egypt from TCI Sanmar Chemicals S.A.E. TCI Sanmar is a part of the multinational conglomerate, The Sanmar Group headquartered in Chennai, India and is amongst the largest caustic soda manufacturers in Egypt’s chemical industry. The calcium chloride turnkey project’s annual production capacity is 135000 TPA and is valued at 20 million USD. Nuberg’s scope of work includes plant design, detailed engineering and procurement of complex chemical equipment for TCI Sanmar for the anhydrous calcium chloride pellets/granules production at its site in Port Said (Egypt). The technology supplier for the chemical plant is Zirax from Russia, a reputed global calcium chloride technology provider. Zirax’s responsibility is to transfer the technology of production of liquid & anhydrous product and to provide basic engineering and technical regulation documents. The plant commissioning is planned to be by the end of 2017. The calcium chloride plant is a part of Sanmar’s already existing chemical complex, incorporating caustic soda plant, EDC (Ethylene Dichloride), VCM (Vinyle Chloride Monomer) and PVC plants. This chemical complex produces hydrochloric acid (HCL) which will be used to manufacture calcium chloride (CACL2). TCI Sanmar chemicals has established world class Plants for manufacturing 200000 TPA of PVC (Polyvinyl Chloride) and 275000 TPA of caustic soda at Port Said, Egypt. These are the largest capacities in the MENA (Middle East & North Africa) region. The company has already invested $ 1.2 billion in its facilities at Port Said and in Phase 2 of the project the company will invest another $ 300 million taking the total investment to $ 1.5 billion. After the completion of phase 2 the PVC plant capacity will double to 400000 TPA and a new calcium chloride granule plant with a capacity of 135000 TPA will come up. The calcium chloride from the chemical plant will be supplied mostly to the markets of North & South America, Western Europe, Middle East and Africa. 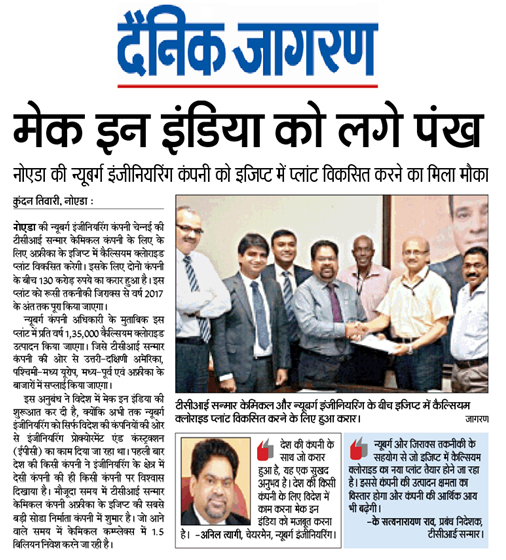 Mr. AK Tyagi, Chairman, Nuberg Engineering said "Winning calcium chloride project in Egypt is another testimony of our engineering prowess and turnkey project management capabilities. We are quite happy of our cooperation with Zirax for TCI Sanmar’s calcium chloride plant and we suppose this experience in Port Said will consolidate our relationship for joint performance as in current project and in other future possible projects with a high professional involvement to meet the requirements of new customers." Mr. K. Satyanarayana Rao, Managing Director, TCI Sanmar Chemicals S.A.E. commented "The start-up of new calcium chloride granules production plant, which we will build up together with Nuberg and Zirax, will significantly raise TCI Sanmar’s revenues and also allow us to expand our product portfolio." Mr. Mikhail Petrushin, General Director, Zirax said "As engineering and production company we consider the signed agreement as a great honor. The cooperation with such respectful and professional clients and partners such as TCI Sanmar and Nuberg will allow us to provide efficient application of our experience and knowledge in high quality anhydrous calcium chloride pellets production for different purposes of worldwide calcium chloride market which, from our point of view, feels shortage of high quality product."